The State We’re In, a great pubic radio program, asked me to write the following piece, about cancer blogging, titled The Nice Cancer Bloggers. You can read the piece below and click here to listen to the podcast. I’m curious to know: when you comment on a cancer blog do you find yourself being more polite or sensitive than if you were commenting on any other kind of blog? 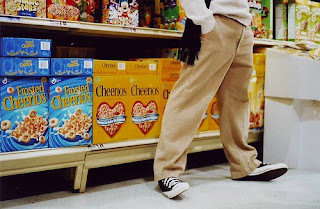 Reaching for a box of cereal in the supermarket, I notice a woman a few feet away mulling over energy bars. She looks to be about my age: late 20′s or early 30′s. And she’s bald – no eyelashes, no eyebrows, dressed in navy sweats. The nervous banter starts in my head. Do I just walk up to her and start talking – tell her that I have cancer too? Would I be invading her privacy? What if she’s never talked to anyone her age with cancer and would be grateful to connect with me? It’s like I’m trying to decide whether or not to hit on someone in a bar. In the end, I grab my Cheerios and head down the aisle – without talking to her. If she wants to, she can find me online. 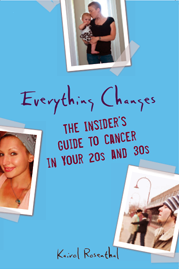 As a young adult cancer blogger I use my blog, Everything Changes, to connect with other 20 and 30-something cancer patients. We are the stray dogs of the cancer world. While older cancer patients huddle on couches sharing symptoms and swapping life stories in support groups, we’re the odd ones out. A handful of young adult support groups exist in major cities, but for the other one-million plus of us, we connect by blogging. Most young adult cancer patients blog about their personal experiences in diary-like detail, updating their friends and family, complaining about nurses, and outing incompetent doctors. I’m more interested in writing about how politics, policies and our own cultural norms affect the quality of our lives, and ultimately how they alter our life expectancy. I’ve always been an opinionated person and blogging is the perfect platform for me to get some dialogue going about what’s unfair in the health care system and how to create change in the world of cancer care. I’ve heard that bloggers can be targets of ridicule, backlash commenting, and cyber stalking – but I’ve never experienced this first hand. And I don’t know of any other cancer bloggers who have. Somewhere there must be a fellow blogger who dares to bash a cancer patient, but I have yet to experience them. In fact, even when commenters disagree with me, they go out of their way to sound kind and constructive. They write long, apologetic disclaimers noting they’re merely stating their own opinion and they understand my perspective too. They’re all just so… nice. But all of these niceties sometimes feel excessive. It’s like having cancer commands people to use a playbook from a non-violent communication course. Sometimes I wish commenters would just don the boxing gloves and go at it with me full force. So the down side of my blogging doesn’t come in the form of stalkers, or nasty commenters. And as frustrating as it sometimes is, I wouldn’t say the downside is excessive niceness, either. Instead, it comes in the form of silence. When someone who identifies themselves only as a noun and their birth year – immortality74, cancermama68 – drops off the face of the blogsphere, you never know why. Maybe they had a great checkup, were told they are in remission, and no longer need the support that blogging once brought them. Maybe they are at a PTA meeting or back at work – or, maybe despite their missing body parts and lack of hair they picked up a boyfriend or girlfriend and are spending time texting and on dates instead of hanging out on cancer blogs. Or maybe their health took a turn for the worse, and they’re back in the hospital for in-patient chemo or a stem cell transplant. Maybe they’ve moved on to hospice. Maybe they’ve died. Perhaps in the end, this is why people are so kind to us, why we’re such a nice bunch of cancer bloggers. Because we never know which of us is actually going to make it. When you’re in your twenties and thirties and staring death in the face, you may have time for online distraction – but you don’t have much energy for online drama. For us cancer bloggers, our online connections are more than about blowing off impassioned verbal steam in our own daily entries. Cancer bloggers are people who seek connection in order to thrive. And we’re desperate enough for it that we might start a blog – or we might walk up and talk to each other as complete strangers in the cereal aisle at the supermarket. Hmmm. I had a blogger friend who had a random person attack her on her blog about her treatment choices. The person neglected to realize her stage and situation, and it was a really painful thing for her. Very hurtful. I think it’s not so much that we’re tiptoeing around each other so much as we’re all trying to support each other as much as we can. And that comes in understanding words and positive affirmations. For me, now’s not the time to be bringing anyone in my situation down. We’re already down, let’s not kick…?